Do you really want a snow plow company with a blade clearing snow from your new driveway? What kind of job will a snowplow company do for you? There are all kinds of issues associated with people who use a blade on the front of a truck to clear your driveway. For example you can end up with the blade overlapping on your grass. It could remove a bunch of your sod from your lawn. This makes an unsightly mess when the snow melts in the spring. What about the impact on interlock? Will the blade damage the surface and leave scratch marks on your new interlocked driveway. Some snowplow operators will use Teflon blades. This should make sure that there are no scraping or scratch marks left on asphalt driveways as well as interlock driveways. These are questions to ask yourself when hiring a snow plow company. In addition to price, clearing times, how much snow must fall before they clear the driveway. Some companies will only clear snow after 5 cm or two and a half inches of snow fall. This may be acceptable for many people however for some they may want the snowplow to clear snow from the driveway more often. Also what happens when the city snowplow operator clears snow off the street and creates a snowdrift at the end of your driveway? 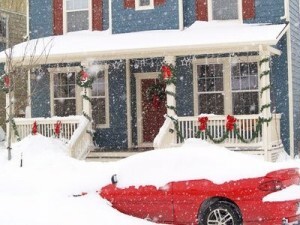 will the snowplow contractor come back and clear the snow from the end of your driveway? They will eventually get to the job, but how long will you have to wait and will it be cleared before you go to work in the morning? Make sure these details are spelled out in the contract. Most snow plow companies operating in urban areas will also leave markers at the end of the driveway on both sides. They indicate where the edge of the driveway actually is. This helps them avoid cutting into the lawn. Or going on to the lawn when they’re clearing snow from the driveway. They are about 3 feet tall and are easily seen by the snowplow company operator. These signs at the end of the driveway left by the snowplow companies are also a form of advertising. Most of them are about 3 inches wide and 3 feet tall. They have the name of the snowplow company as well as the phone number. Your eighbors can see who you’re using and decide for themselves if they would like to get the same company. Our neighbor has hired a snowplow company to clear snow off the driveway. They also shovel the snow from the steps leading into his house. This is a service that many companies will provide. However he also has one car that is left permanently on the driveway. The snowplow operator cannot get close to the car for fear of damaging the car. The snow shovelers when they arrive will also shovel the snow from around the car. Typically there are two crews. The first one will clear the snow using a snowblower on the tractor. The second crew will show up several hours later and clear the snow from the steps and also from around the cars mentioned. He is quite well-off and does not mind paying for this extra work. I’m quite sure that he pays a lot for the service. Whether you just need your driveway cleared of snow, or would like extra services such as Clearing snow from around your parked car and the steps leading into your house always negotiate the best price that you can. Many Snow plow companies will provide a discount if you sign up with them early on the season, while others will discount the fees if you decide to only hire them for a couple of months. They will prorate the annual cost of clearing snow from your driveway over the number of months that you actually need the service.